Taylor Gait scores for Canada while under pressure from Charlotte Lytollis at the 2017 FIL Rathbones Women’s Lacrosse World Cup at Surrey Sports Park, Guilford, Surrey, UK, 15th July 2017 (Credit Ady Kerry). 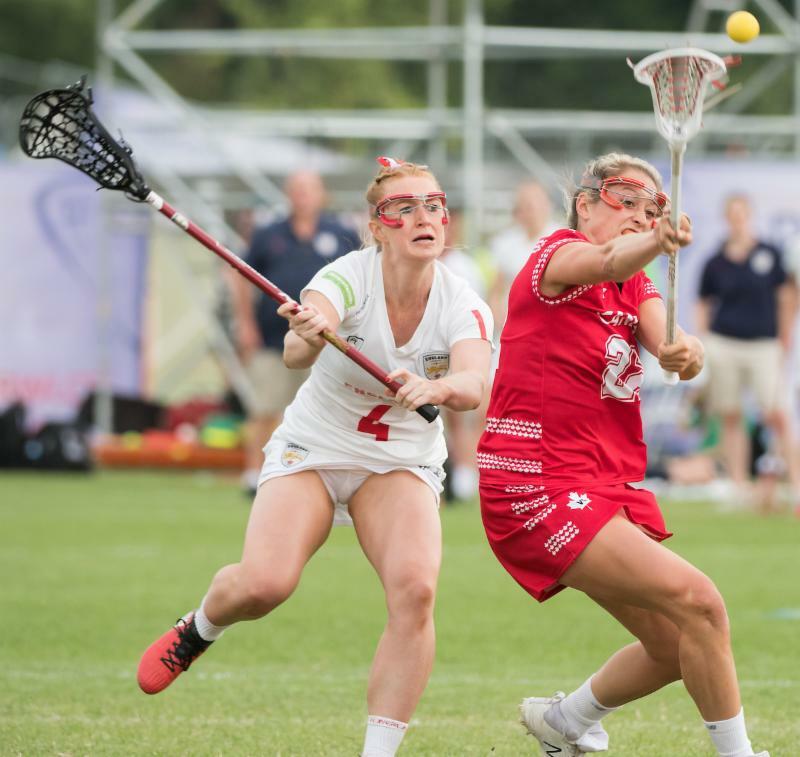 GUILDFORD, ENGLAND – Canada defeated host England by a score of 8-6 on Tuesday in a thrilling match to end pool play at the 2017 FIL Rathbones Women’s Lacrosse World Cup. The win gave the Canadians a 3-1 record, good for the second seed in Pool A, behind unbeaten rivals the United States. They advance to tomorrow’s quarter-finals, where they will take on upstart New Zealand, who scored an impressive win over the Haudenosaunee in their cross-over game, which earned them a spot in the top group. After being stymied by a tough England defense for much of the first half, Canada’s offense came to life, scoring five unanswered goals in the final 11 minutes to enter the break with a 6-3 lead. The Canadian defense was on their heels for much of the second half, trying their best to hold off a determined England team, who were playing in front of a sold out crowd at the Surrey Sports Park. While they got the result they wanted, the Canadian players were not necessarily happy with the way they played. Taylor Gait, who scored in three straight games entering today’s contest, had a breakout performance. Her hat-trick paced the offence and earned her the game’s MVP award. Canada’s leading goal scorer Erica Evans continued to put up big numbers, scoring two more goals to bring her tournament total to 12. Dobbie also added two, while Megan Kinna continued her consistent play, scoring one. It will be a quick turnaround for the team, who have already played four games in five days, but while fatigue may be setting in, Dobbie does not see that as an excuse for poor play. Today’s quarter-final game against New Zealand, which starts at 12:00PM EST, as well as the remainder of the tournament’s playoff games, will be shown live on the BBC Sports website (geographical restrictions may apply). They can also be streamed live from anywhere in Canada through a pay-per-view webcast provided by www.247.tv.